The ACL Toolkit is a product of Transit Planning 4 All, which is sponsored by the Department of Health and Human Services' Administration for Community Living (ACL) in collaboration with the Department of Transportation's Federal Transit Administration (FTA). The Administration for Community Living (ACL) is sponsoring the Transit Planning 4 All project to demonstrate the value that inclusive processes can bring to community transportation efforts. This toolkit synthesizes the work of an extraordinary partnership of the US Department of Health and Human services Administration for Community Living (ACL), the Community Transportation Association of America (CTAA), the National Association of Area Agencies on Aging, the Institute for Community Inclusion, and DJB Evaluation Consulting Group. We thank ACL for sponsoring the toolkit. For more information about Transit Planning 4 All and the federal and other partners, please visit the About page of the Transit Planning 4 All website. Transit Planning 4 All has funded a series of pilot projects across the nation, each seeking to increase inclusion. This Inclusive Transit Planning Toolkit is a collection of key lessons learned and strategies for transit systems, leaders, and advocates to help them increase inclusive planning wherever they are. A core recognition of the need to involve persons with disabilities in decisions that impact them. The perspective of the growing older adult population and the need to provide a mechanism for aging in place. Building on the promise of participatory planning that has been an integral part of the federal transportation program since its inception. 1. What transportation needs exist in the community? 2. What needs do participants identify as most important to address? 3. How inclusive is transportation planning now and how does it identify transportation priorities? The assessment process can include gathering information from a wide range of participants, partners and stakeholders, and should include people or partner organizations committed to being involved. If possible, include those whose interest in the initiative is limited, but who will be impacted by the work to be undertaken. Surveys, public forums, interviews, focus groups and other information gathering methods are ideal during this phase of the project. Many organization leaders feel they are using an inclusive approach. Is this the reality for different populations of transportation-challenged individuals, especially older adults and people with disabilities? These are some in-depth questions to ask. • Do participants (people with disabilities and older adults) feel included? • If meetings are open and advertised, do participants attend? • Is the meeting being held in a time and place in which they can participate? • Is a meeting the best type of forum for being fully inclusive? • Can inclusive public participation be accomplished at community events or venues or via social media? • If participants attend, are their opinions sought? • If their opinions are sought, do those running the meeting take the time to ensure that what they are hearing is what the participants intended? • Are surveys conducted to determine if participants are satisfied with inclusion or if they feel their voices are heard? • Is there a system in place to track whether participant suggestions are vetted and implemented? • Do participants share in the decision-making process? Do participants play leadership roles in your organization or partnership efforts? 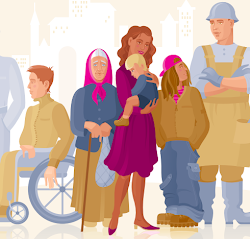 To assess the degree of inclusiveness in your transportation planning efforts, engage in candid discussions involving people with disabilities and older adults using questions such as those listed on this page to create an open and honest dialogue. Remember that different programs and partner organizations may be at different levels of inclusiveness. The goal of inclusive coordinated transportation planning is systemic change - long-term strategies and practices that are engrained in the fabric and culture of an organization. The theory of change that has guided the efforts of this ACL-funded Transit Planning 4 All project is that meaningful engagement of participants in the planning process will lead to the development of community and public transportation services that are responsive to the needs and preferences of users and potential users of such services. Specific service improvement goals should emerge in an inclusive planning process. Thus, inclusive transportation planning, while primarily concerned with increasing inclusivity, can improve transportation through expansion of current services, introduction of new services and/or more consumer-responsive services. It is important for the parties involved – participants, partners and staff – to reach consensus on an initiative's goals, think of success along a scale where the ultimate objective is one measure of success and interim milestones are recognized as significant achievements. The viewpoints of all involved in the initiative, especially riders and potential transportation users, should be considered in defining success. Even if the ultimate goal of the initiative is not achieved, the engagement of diverse participants in the transportation planning process and their commitment to continuing involvement are significant steps in inclusive coordinated transportation planning. Barriers to an inclusive transportation planning initiative's ultimate success are inevitable. No initiative perfectly unfolds the way planners imagined at the outset, so identifying potential barriers, especially those outside the control of the lead agency and key partners, is advisable. Be sure to identify reasonable expectations and interim milestones that can be pointed to as evidence of forward movement. These victories can keep participants and partners engaged. Build trust and commitment so that participants and key partners understand that change may be slow and incremental, but that staying the course will lead to real improvements. In the middle of an initiative, success may seem far off. Having interim milestones in place enables partners and participants to recognize progress. Marking accomplishments and acknowledging hard work are critical for keeping everyone interested, building camaraderie and inspiring everyone to remain committed. Jewish Council for the Aging (JCA): This project sought to increase understanding of the transportation and mobility needs of older adults and people with disabilities, as well as the community transportation options available to them. The JCA project created an advisory panel comprised of older adults, people with different types of disabilities, and key stakeholder groups. Members of the panel actively participated in, and led, outreach activities – including focus groups – to reach the broader community. These efforts contributed to the development of educational brochures and flyers describing specific transportation options. AAA 1-B: This project adopted an educational, awareness building, and engagement goal focused on supporting the creation of a coordinated regional transportation system that will, ideally, assure older adults and people with disabilities access to the services they need. AAA 1-B's efforts led to new peer-to-peer travel training that responded to participant recommendations. The Arc of Connecticut: This project developed a web-based system for coordinating and making available human service transit resources and relevant information to older adults and people with disabilities. The Arc's engagement of older adults and people with disabilities led to hiring an individual with a disability as a web consultant. Inclusive planning encompasses communication, outreach, and a variety of levels of participant engagement. Outreach activities, such as surveys, focus groups, and community meetings and involvement at events should elicit experiences and recommendations from a wide spectrum of transportation users and non-users. To whom should you reach out? Start with people with disabilities and older adults. Consider outreach to specific transportation-challenged populations in your region, such as veterans, low-wage workers, students, non-English speaking individuals, new immigrants, and refugees. Consider also whether there are groups within any population with particular pressing needs, such as people who are deaf or hard of hearing. Equally important are activities that engage a smaller cadre of committed participants who form an advisory group/expert panel that meets regularly throughout the project and assumes leadership roles in the inclusive planning process. A timeline for activities is critical and should focus on moving the project forward to reach implementation benchmarks. Potential barriers may arise that slow progress, necessitate changes in activities, or even require a reassessment of the project goals. Therefore flexibility and realistic expectations should be built into the timeline. 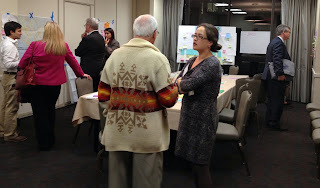 Knoxville-Knox County Community Action Committee (PDF)(141 KB) developed a Meeting in a Box concept to spur useful discussions with older adults and people with disabilities in locations where they generally met together. AAA 1-B (PDF)(141 KB) broadened its outreach to the community at-large through staff willingness to meet with new groups and respond to invitations from organizations with which they had never before partnered. As organizations and agencies move forward - relying on the findings of the baseline assessment – they may want to seek advice or guidance from an external advisory group, such as an advisory committee, steering committee or stakeholder group. This group should include diverse representation, including people with disabilities and older adults. 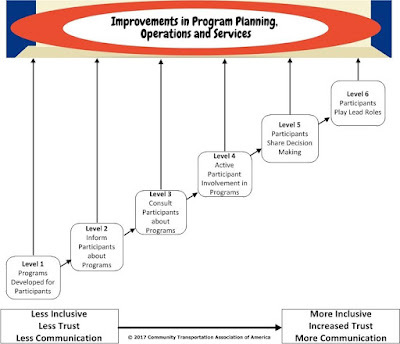 Members of advisory groups should be familiar with or be taught about program operations (including constraints), government policies that impact transportation operations, the process for changing systems, and how long change might take, as well as critical timeframes for getting inclusive transportation planning done. Critical to establishing an advisory group is ensuring that all meetings, communications, and other forums – whether in person or virtual – are accessible. For example, it is important to hold meetings and public forums in places that people that use wheelchairs or seniors with mobility difficulties can access. When announcements about meetings are made, meeting planners should ask if those who will attend the meeting have any accessibility needs, such as interpreters, particular climate needs, or dietary considerations. Make sure that all advisory group members have reliable means of transportation and that accessible transportation options are available for anyone who needs it. Lewis and Clark County created a representative and effective transportation advisory committee that included the active participation of seniors and people with disabilities. Jewish Council for the Aging's (JCA) (PDF)(144 KB) advisory group included a member from the Chinese-American community who organized and conducted a focus group in Mandarin to obtain input from members of that community on their most pressing transportation issues. Participants and partners each come to the table with their own perspectives; however, everyone does not know the same things. Taking time to learn from each other is critically important. Learning in terms of inclusive planning means listening to – and learning from – others. Inclusive transportation planning is designed to emerge from real-life experiences. It takes on different characteristics, depending on the community, its history and what the participants in the process - people with disabilities, older adults, community stakeholders, local government, transportation providers, key partners, etc. - expect and want to see happen. True inclusive planning is based on participant engagement and leadership. Professionals and participants alike must approach inclusive planning with an openness to learning from others. Understanding constraints and political processes at the outset can help all participants identify realistic goals and objectives while still working for broader systems change over a longer period. An inclusive planning program design must be based on input and guidance obtained from local coordinated transportation partners and both older adults and people with disabilities who are either users or potential users of community transportation services. Such partnerships should include public transit, and aging and disability organizations. A broader spectrum of partners will include health or human services organizations, groups that focus on transportation or the built environment, faith-based organizations, political leaders, schools, healthcare institutions, economic development entities, and businesses. It many also include representatives of other transportation-challenged populations in your region, such as veterans, low-wage workers, students, non-English speaking individuals, new immigrants, and refugees. It is highly recommended to be active to ensure that government officials and political leaders are at the table. At a minimum, keep these leaders apprised of the work being undertaken in the inclusive planning initiative. The AAA1-B (PDF)(141 KB) project sought the advice and counsel of people with disabilities and older adults in the field from the outset by linking with external organizations, such as the Harriet J. Tubman Foundation. This external entity is a well-established, well-respected community organization already linked to the area's developing regional transit authority (RTA). The project determined the RTA to be a critical infrastructure in improving the region's transportation service, and it was important that the voices of people with disabilities and older adults inform the development of the RTA. Ordinary communication tools and social media can be used to support efforts to engage seniors and people with disabilities in inclusive coordinated transportation planning. In the Transit Planning 4 All projects, email was primarily used to notify participants of upcoming advisory group meetings and to keep members apprised of developments. Beyond the usual social media venues of Facebook and Twitter for distributing information broadly, grantees tapped a number of different social media outlets. 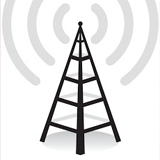 The Knoxville-Knox Community Action Committee project used Survey Monkey as a survey platform. Lewis and Clark County used online polling of its technical advisory group to review a proposed route map for a planned transit expansion in the community and NationBuilder software to track interest, organize meetings and manage communications among a diverse and scattered group of participants, partners and consultants. The Arc of Connecticut set up reminders and deadlines on their consultant's smartphone to track the work underway and found Skype useful for sharing information quickly and efficiently. The following activities are necessary to measure performance and evaluate inclusive transportation planning efforts. One of the keys to evaluation is to see it as a continuous process that begins before new inclusive transportation planning efforts start. It is therefore useful to collect baseline data as you begin. This is how you will know where exactly you are starting. Visit the Start section, above, of the toolkit webpage for details about this critical step. An inclusive strategic planning approach starts with setting goals, establishing objectives, deciding what performance to measure, collecting existing data, and determining the activities to conduct based on the collectively identified goals and objectives. Put in place a strategic plan that can be occasionally revised and that will set your inclusive transportation-planning project in a realistic and achievable direction. Involving participants and partners will enhance your ability to communicate about your work. Goals are a broad statement of the purpose of an initiative. They may take several years to achieve. Objectives are incremental signs of progress towards the established goal. Make sure that objectives are specific and measurable. Measurable means that quantitative measures of progress in achieving the objective can be established. For example, measuring the percentage increase in the number of participants actively involved in inclusive transportation planning is a typical quantitative measure of progress. Qualitative measures such as measures of participant or partner satisfaction may also be acceptable, but should be summarized so results can be reported as a number, for example the percentage of participants who indicated a process was inclusive. Activities answer the question, What will we do? Activities must align with the identified goals and objectives and must be realistic given the resources available (funding, staff, volunteers). The desire to change the world can often lead to unreasonable expectations, so an occasional reality check during the process is useful. Inputs: What resources are being used? Inputs identify the funding, staff resources, volunteers and in-kind resources used to as part of the inclusive coordinated transportation planning project. Outputs:What will the activities produce? Typical outputs for inclusive transportation planning projects include the number of participants serving on advisory committees, number of partnering organizations and number of planning meetings held. Outcomes provide numerical information documenting progress towards achieving project objectives and goals. The key question with an outcome is, How will conditions change as a result of the activities we are conducting? The link between program activities and outcomes observed can be complex and may be influenced by many things, so it is important to understand these linkages and to be realistic about the extent to which activities are responsible for changes being observed. 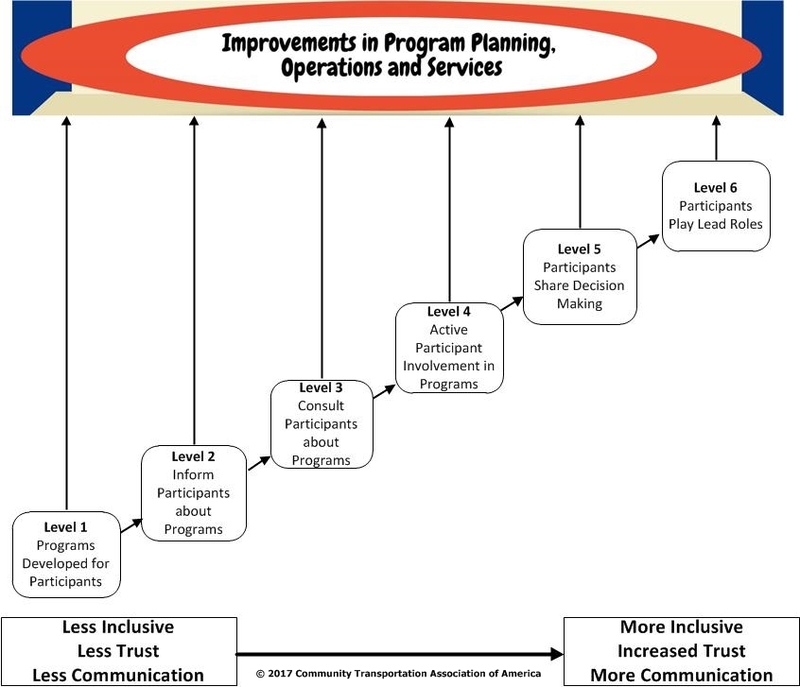 Outcomes specific to inclusive planning practices include the number of participants assuming leadership roles, the percentage of participant transportation issues addressed or resolved, or the number of transportation improvements implemented. In the long run, one would hope to see more trips by the members of your target population[s] and higher quality transportation services. Jewish Council for the Aging (JCA) measured achievement of its aspirational outcome, an 80 percent increase in participants' knowledge of transportation options, by conducting pre- and post-surveys of older adults and people with disabilities and compared the results. Impacts:In the long run, what difference do you want to make in your community, or in the lives of people affected by your program initiatives? If your program can be sustained, the outcomes that your program is achieving on a regular basis will hopefully result in improvements for participants, partnering organizations and your community. Customer Satisfaction measures should go beyond whether participants and partners are happy or satisfied. These measures are an opportunity to understand, What do participants and partners think? Examples of measures include participant satisfaction with the planning process, stakeholder/partner satisfaction with the planning process, percent of participants who felt their opinions had an impact and the percent of participants who were highly satisfied with leadership opportunities. Targets are quantitative estimates of what will be accomplished by your project within a specific time period, typically a year. Longer-term target setting is great as long as the target is realistic and monitored regularly. Targets should be determined based on prior experience, such as a baseline measurement before activities started against which progress would be compared. Targets (as opposed to goals and objectives) must be quantitative measures of progress. Records: It is critical to keep a written record of the goals, objectives, activities and performance measures. Don't try to measure everything! Select measures that are meaningful for communication, decision-making and accountability. Measurement data should be collected regularly using a consistent, objective process that prevents reporting distorted or biased results. The key is to describe an objective method that someone else could use or audit to arrive at the same results. Reporting records should be openly shared with participants, partners and funding agencies. Make note of conditions and issues that may have positively or negatively affected progress towards targets. A strategic inclusive transportation plan that is widely distributed and subjected to feedback will provide the framework for the work and a record of what you hope to accomplish. In The Case for Inclusion, to assess services for individuals with intellectual and development disabilities, a research center at the University of Minnesota, in collaboration with United Cerebral Palsy, examined Medicaid policies and practices across states related to inclusion and provided a numerical scoring rubric related to four variables. Qualitative services and practices were scored to produce data to rank states according to four variables related to services for individuals with intellectual or developmental disabilities. If you are new to performance reporting it can be a bit confusing. An activity is what you do. An output measure is how much of what you do. An outcome measure is how much of a difference it makes. An activity specifies what you are doing. An output measure specifies what is produced as a result. An outcome can be a narrative description of a desired state/objective. An outcome measure is a number that is used to communicate how much of a difference is being made. Performance measures must be quantitative, meaning it must be a number. An easy shortcut is to start all performance measures with number of, percentage of, percent increase, or percent decrease. Set a numeric target. Use results from your existing experience or similar projects to set targets. Qualitative data, such as narratives, testimonials or quotes may be useful for context and documenting results, but are not performance measures. If doing surveys, include a 4- or 5-point Likert scales (1=strongly disagree to 5=strongly agree) rather than simply asking for a yes or no answer. You'll have richer, more precise results. A model is a great tool for communicating what your inclusive transportation partnership is trying to accomplish. The logic model links resources (inputs) to activities (what are you doing with the resources) to what you are producing (outputs) and to what you are accomplishing (outcomes). The logic model also will help you be precise in selecting relevant, useful performance measures. The W.K. Kellogg Foundation has some excellent resources on logic models. The Logic Model Development Guide does a nice job of explaining the relationship between different elements of a logic model. In a logic model, one element is expected to lead to the next element in sequence. Logic charts are often used. Use arrows or other visual links to specific activities, outputs, and outcomes. Logic models often include a list of potential performance measures. Logic models may not be as effective in laying out the sequence of events that will lead to the changes your initiative envisions. In dealing with the diverse stakeholders represented in most inclusive transportation planning projects, attitudes and perceptions are important considerations. While producing outcomes is important, it can be a long-term process. Oftentimes, monitoring the perceptions of stakeholders to provide continuous information and feedback is the key to sustaining longer-term activities to change attitudes and improve services. For example, simply asking if people with disabilities and older adults are satisfied with inclusion may be insufficient. It is critical to ask these stakeholders if others seek out their opinions and feedback and whether they feel that they are being heard. Collecting feedback is not just the right thing to do, but also a critical step in the inclusion process. Set up a system to collect objective data. You'll want to routinely and regularly collect measurement data. If you develop a survey to collect feedback on inclusiveness, use it regularly, such as at steering committee and other meetings attended by people with disabilities and older adults. Monitor results regularly. Regular monitoring, supported by detailed data collection, will help you see when things are going well, and when some of your project activities might need some attention to improve performance. Track both inclusiveness as well as program results. Inclusiveness is a means to improving performance, not just an end in and of itself. Continuously monitor your inclusive activities. Share the results with stakeholders to let people with disabilities and older adults know that you care about their involvement. Investigate irregularities in your results. Things don't always go as you expect. If you get unexpected results when regularly collecting performance measures, look into it. Performance measurement produces regular feedback. Be sure to use the feedback to monitor programs and make decisions. On a regular basis (quarterly or annually), consider the trends in your performance measures, and if appropriate, revise your approach. If you are greatly exceeding your targets, or having trouble reaching the targets, the problem may be target setting, not the results. Consider revising your targets, but don't do it so often that the targets become meaningless. Analysis helps you assess if you're doing the right things and doing them well. Analysis of performance data supports management decision-making. Such analysis can lead to the modification of policies, operational procedures, and processes. An added benefit is that the evaluation process will help you prove to others that you're doing the right things and doing them well. Periodically assess performance, measure progress to determine the achievement of goals and objectives, and to consider future actions. Be sure to identify reasonable expectations and interim milestones that can be pointed to as evidence of forward movement. These victories, often, will keep participants and partners engaged. Agencies – at the state or local levels – may want to develop a system of collecting data regarding inclusive coordinated transportation planning practice that can be used by organizations as a self-scoring tool, or, at the state level, as a mechanism to enable organizations to compare themselves with each other. If you collect data to measure performance, is that the same as program evaluation? You can measure without evaluation, but you cannot evaluate without measurement. Performance measurement is not a quick turn-around substitute for evaluation; instead, performance measurement supports evaluation and may point to a need to do more rigorous evaluation activities. You should be routinely collecting and monitoring performance measurement data. However, if you want to know why something is happening rather than just what is happening, that requires a commitment to evaluation. When inclusive coordinated transportation planning is sustained, people with disabilities and older adults play important roles in planning, implementation and operational decisions. When inclusive practices are embedded in an organization, when a cultural shift occurs, inclusive practices become an everyday part of organizational systems and processes. Ultimately, transportation services for people with disabilities and older adults are improved because the needs of diverse riders are considered. Inclusive coordinated transportation planning is not a one-time phenomenon. 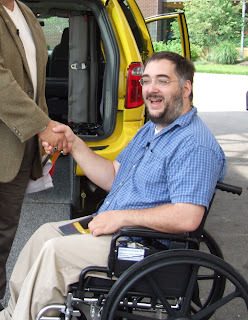 Rather, it is a sustained and deliberate set of practices as well as a philosophical shift within an organization to include people with disabilities and older adults in every facet of the organization - often in ways that enable their perspectives to influence transportation services. This page focuses on the institutional aspects of planning, implementing and continuing positive changes as you sustain your efforts. When it comes to implementing an inclusive coordinated transportation planning initiative the importance of planning cannot be overstated. The Transit Planning 4 All projects used customized strategies to develop and implement inclusive coordinated transportation planning. Common themes emerged from their work. * External factors that may mediate program results. A comprehensive plan will assist an organization. If organizations are thoughtful in planning, and systematic in implementation, an inclusive culture with the active and vibrant participation of people with disabilities and older adults, can be sustained. Implementation of new strategies, adjustments of old practices, or aspects of a momentous involves change. Implementing change is not always easy, and sustaining change is even harder. Business leaders and management experts suggest that that there are three phases of implementing change. Incorporate these activities into a plan. Measure performance and evaluate. For more information, refer above to the Evaluate section of this page. As you plan, implement, and evaluate, integrate methods of how change will be sustained after initial achievements. The Transit Planning 4 All project defines outcomes as specific measures of a program's impact or results that can specifically and logically be attributed to the program. The pilot projects paint a picture of incremental achievement. At the end of two years, none of the grantees had created a fully inclusive coordinated transportation system or completely achieved their ambitious goals to improve transportation in their communities. However, each was able to identify specific changes in the community that showed progress along the way to realizing the full benefits of inclusive transportation planning and ensuring that inclusive processes become the norm in transportation planning, service delivery and oversight. Inclusive coordinated transportation planning, implementation, and sustaining require commitment and funding. The lead agency will need to dedicate funding and staff resources to the effort in order for it to succeed. The amount of funding necessary will vary depending on the amount of work and the willingness and commitment of other organizations to provide staff and in-kind support to the initiative. Budgets must consider preliminary work, including collecting data, conducting surveys or convening focus groups. Other issues that typically impact budget include: The need for an outreach campaign to reach specific population groups; whether there already is a functioning and willing advisory group with the potential to be expanded and empowered to conduct inclusive planning; the need to develop print materials to educate older adults and people with disabilities about current transportation options; and the desire to invest in technology to develop a more engaging website, a one-call/one-click resource center, or other communication vehicles. The need to consider sustainability of the effort from the outset cannot be over-stated and requires local commitment and ongoing efforts of participants and partners. Use the Evaluate section of this webpage, above, to consider what data to collect and to establish processes for evaluation that will inform decisions to improve inclusive strategies. There is no magic formula for determining the amount of staff resources needed to undertake inclusive coordinated transportation planning. The seven demonstration projects typically identified a project director who oversaw all activities and was responsible for reporting and managing consultants. The project director was not a full-time position for every project and the degree of day-to-day management and activity varied. Sponsoring agencies of the seven projects often provided staff support for additional management and guidance. The seven inclusive coordinated transportation planning demonstration projects dedicated a percentage of labor to assure that the activities underlying their goal of inclusive coordinated planning were achieved. Sufficient staff time should be in place to devote to implementing project activities Many projects hired qualified staff with expertise in diverse populations. Timelines were established, continuous improvement processes were implemented and interest in creating inclusive practices became part of the mission and purpose of the organizations involved. When the Alaska Mobility Coalition (PDF)(136 KB) was hiring staff, it recruited directly from the local Center for Independent Living. Knoxville-Knox Community Action Committee collaborated with the University of Tennessee's Department of Industrial and Systems Engineering to develop a tablet-based app. The Arc of Connecticut partnered with People First of Connecticut to build an accessible website. Lewis and Clark County engaged numerous consultants to help shape their project, some of whom volunteered their time. * Participants in riders' groups. In the Transit Planning 4 All projects, partners and participants proposed creative ideas, shared information in groups and individually, served as cheerleaders for project accomplishments, and sought new opportunities and partners. The bottom line is that participants took on the roles they needed to play, rose to the challenges, and contributed countless hours of time, energy and hard work to the seven demonstration projects. From the outset, the leadership and commitment of a lead/sponsoring agency – whether a transit agency or an organization supporting older adults or people with disabilities – is crucial to success. In order for inclusive transportation planning to be adopted as normal practice, support and commitment must come from the top and not be confined solely to the individuals or the management unit that is engaged in the initiative. Do not underestimate the impact of efforts to help agency leaders understand the importance of the project and see the potential benefits of inclusive planning for other agency priorities. Make the case for inclusive planning by educating agency leadership, other staff within the organization, agency partners, political leaders, and involved older adults and people with disabilities and their representatives about the potential benefits of inclusive planning. Strategic briefings should be convened periodically to report on the initiative's accomplishments. Data from the project and illuminating anecdotes should be conveyed and connections made between the work of the project and other agency priorities. An organization's characteristics, systems and policies influence inclusive practices. Recruitment, hiring, and professional development are important opportunities to integrate inclusive practices into an organization’s work. Planning and implementing inclusive coordinated transportation planning are great opportunities for administrators to review job descriptions, examine their recruitment resources and review their interview processes. Ensure that recruitment and hiring practices are inclusive. Use accessible outreach efforts, such as communication materials that are available in alternate formats. Contact organizations with which people with disabilities and older adults are familiar as a way to diversify the range of applicants for recruiting and hiring. Provide ongoing professional development. Professional development should focus on the value of inclusive coordinated transportation planning to the transit provider and especially to the system upon which riders with disabilities and older adults rely. 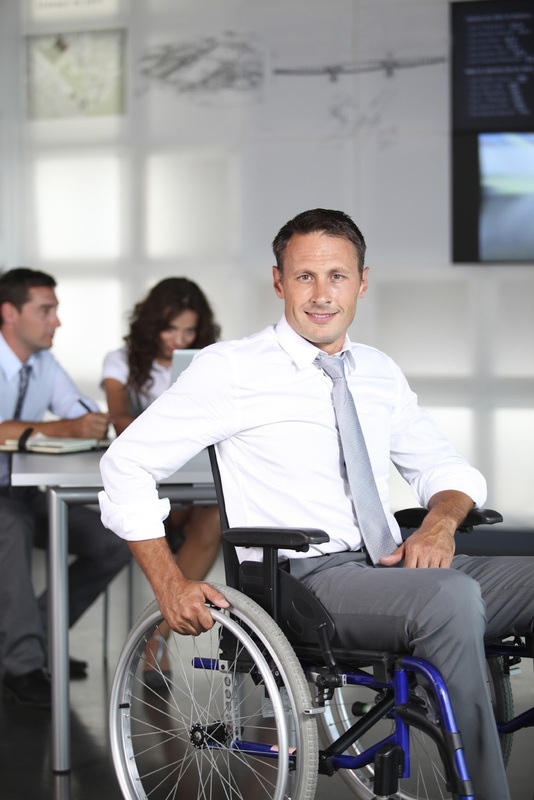 Employees in a workplace may or may not have experience in interacting with people with disabilities or older adults. Offering professional development regarding topics such as disability etiquette, communications with people with older adults, understanding specific disabilities and assistive technology helps employees feel more comfortable with colleagues with disabilities or older adults, and also facilitate their comfort in outreach, recruiting and hiring. Employ accessible technology tools for planning, communicating and administering services. As organizational personnel develop and implement strategies to implement inclusive coordinated transportation planning, it is important to consider what is going on outside of the organization. * The political context and priority focus of particular local organizations and governing bodies. * Laws, regulations, and local funding initiatives. * Mechanisms to both garner support and win visibility from external organizations. Activities should be designed to help move an initiative toward its major goal(s). The the Transit Planning 4 All project includes seven local inclusive transportation planning demonstration projects, each with unique goals and activities that reflect their regional circumstances. Open communication with agency leadership is a must, particularly when things are not going as planned. Sometimes transportation improvements don't happen on an anticipated timetable or hoped for improvements otherwise fail to meet the expectations of participants for rapid change. In an inclusive process, the key is to maintain engagement for the long haul. Lewis and Clark County (PDF)(138 KB): The Transportation Advisory Committee evolved into a representative body that advocated for change through adoption of an action plan presented to local government. However, their ultimate goal of creating new transit routes hit a barrier, due in part to the amount of time it takes to make change in a government-operated service. Technology is a means to an end, a facilitator of communication and information. For example, one-call/one-click transportation resource center technology offers information on community and public transportation options and enables on-line scheduling of rides. Automated call systems notify riders that a ride is on the way and improve the rider's experience. 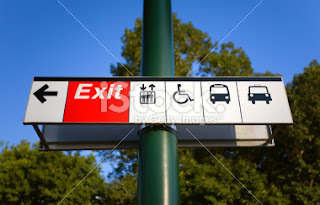 Equipment, such as wheelchair lifts and ramps, kneeling buses, and portable ramps, deliver accessibility. Many regions are developing applications that increase the accessibility of transportation information or impact how rides are provided to seniors and people with disabilities. Two of the Transit Planning 4 All’s demonstration projects focused their efforts on the development of technology applications. The Knoxville-Knox Community Action Committee (CAC) project team identified that communication between transit operators and riders with disabilities and older adults was a barrier to inclusive services. Riders did not feel comfortable traveling independently on the community buses, and transit drivers did not feel comfortable interacting with the diverse range of potential passengers. Through Project ERIC, the CAC developed a transit application that facilitated communications between riders and transit personnel. The tablet-based software application facilitates communication between drivers and seniors and people with disabilities riding on transit buses. 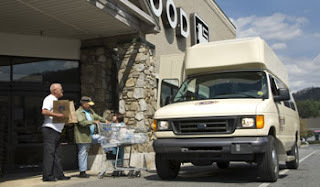 The Arc of Connecticut developed TransitNet – a transit network directory for Connecticut – to make available human services transit information accessible to older adults and people with disabilities. When inclusive coordinated transportation planning is sustained, people with disabilities and older adults play lead roles in planning, implementation and operational decisions. When inclusive practices are embedded in an organization, when a cultural shift occurs, inclusive practices become an everyday part of organizational systems and processes. When transportation officials create a welcome environment and specific channels for the perspectives of people with disabilities and older adults to be heard and acted on, sustainable inclusive practices inevitably follow. When an organization perseveres to assure that a philosophy and practice of inclusive coordinated transportation planning is in place, when it continuously assesses and modifies its approach, and when it adapts and reacts to changes in external and internal organizational factors, inclusiveness will be sustained. Sustainability necessitates a commitment with a long-term view of inclusion. The desired end product of an inclusive process is the embedding of the perspectives of diverse populations in the design and delivery of transportation operations - over time, consistently and deliberately. Sustainability implies an implementation mentality – that the system and culture are changed. It necessitates that the changes leading to sustained activity are personal, that the perceptions and feelings of those involved are affected. The Knoxville-Knox Community Action Committee (CAC) project team used various community meetings, including the Mayors Forum on People with Disabilities, to share the activities and outcomes of their inclusive coordinated transportation planning demonstration with the community. This visibility led to local and state-wide recognition for the Knoxville team and further confirmed its commitment to inclusive coordinated transportation planning. This statewide visibility also helped the project identify potential funding resources. Stakeholders – both inside and outside of an organization – and partner organizations must be committed to the spirit and practice of inclusive coordinated transportation planning. Commitment comes from being knowledgeable about a particular topic, and understanding its impact on either personal or organizational practice, or both. This means that it is necessary for organizational administrators to educate staff through high-quality education and professional development with periodic refreshers, to assure that employees, volunteers and other internal stakeholders are current in their knowledge of inclusive practice. Organizations will want to provide staff with materials on an ongoing basis, such as those available through theTransit Planning 4 All website, that will educate personnel on topics and legislation important to inclusion. For instance, the Americans with Disabilities Act, with its civil rights protections for people with disabilities or the Older Americans Act that provides safeguards for seniors, are key policy statements that outline services and practices for people with disabilities and older adults. More recently, the Workforce Investment Opportunity Act (WIOA) requires practices that promote competitive integrated employment - or, inclusive workplaces. Ride Connection (PDF)(137 KB) was asked by its State Coordinating Council to assure that people with disabilities and older adults were participants in the planning process. This statewide role, in part, came about because Ride Connection was recognized by state leaders as being an innovator and a catalyst for inclusive planning. Throughout its project, Ride Connection improved the visibility and transparency of inclusive coordinated transportation planning by continuously engaging community and regional stakeholders, developing products and materials that shared information about their work and identifying multi-level opportunities to communicate their successes and challenges. The Alaska Mobility Coalition updated the city of Fairbanks's transportation coordinating plan, incorporating improvements that will benefit older adults, people with disabilities, and low-income individuals.